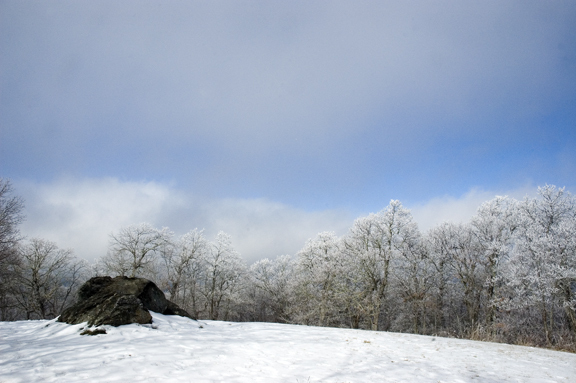 I relieved much of my stress as I trudged through crunchy snow on Howards Knob this afternoon. Rime ice covers the tip top trees on most of the high ridges. The contrast between blue skies and white snow made me feel quite alone--and trust me, in the mood I was in at the time, that was probably a good thing. I rotated this image, but that was only after I returned home to thaw out my fingers and toes. 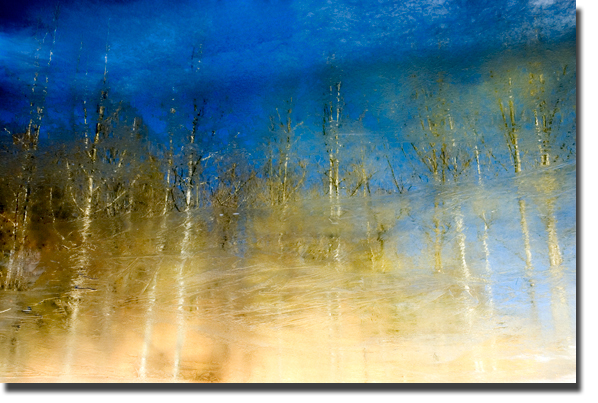 This is an image taken on the ice gathered on the Watauga River while I straddled the bridge near Preacher Billings Rd. A couple days of ice which runneth over make for ripples and dents and well, interesting images of the quite ordinary winter trees. It helps to time the photo sessions as the sun lowers (or rises, yawn) to help intensify the colors. I used no filters or Photoshop other than 'Sharpening' in the photo. It is Momma Nature made-I just rotated her a bit to suit me. Here Mom. 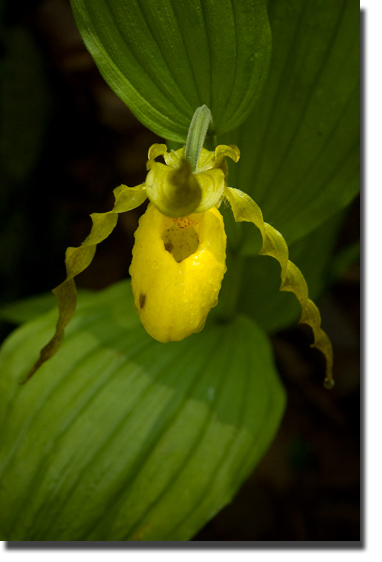 I shot this Yellow Lady's Slipper just for you. I was at the Daniel Boone Native Gardens on Friday and when I saw these orchids in bloom I thought of you and the little glass slippers you collect. As I inched my way around the rare blooms I got my sneakers and britches soaked with the morning's dew. I felt like I was six years old again picking a bouquet of Bachelor's Buttons for you from the field off of Green Rd. Remember? Anyway. I saved this photo to post for you today because of all the people in my life you have been the one who from the very beginning, has encouraged me to color outside the lines of convention. With a never ending supply of poster board, scraps of material, paste, carpet samples and magic markers, you always allowed me to express myself without restraint. My media may have changed from paper mache to pixels posted on a blog, but without your first lessons encouraging my artisitc freedom who knows if I would have stopped to take this photo for you? You may have just gotten some old dumb thing from me instead:) Love ya. See you soon. And for those of you out there with teenage daughters. Here is a Prayer for Adolescent Daughters from a Menopausal Mom Thanks Wendy for the link. 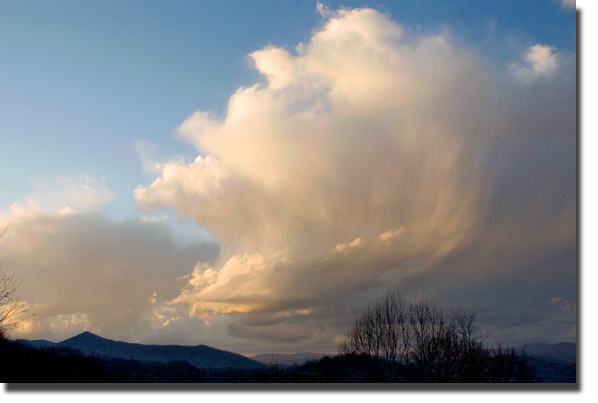 Yesterday evening I watched this frothy white cloud painted multi-colores by the setting sun. After several minutes, it eventually made its way across the mountains only to be broken apart by lofty winds and disappear. I marveled at it and hoped I was not the only one to witness its creation and departure. As I loaded my photos onto my laptop, my youngest looked over my shoulder. "Ohhh such a pretty cloud," she said. "Which one should I put on my blog?" I asked. This is the one she chose.